I wrote a study of best practices for advertising sales at news startups for the Tow-Knight Center for Entrepreneurial Journalism at CUNY. 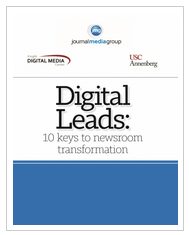 Here is a post I wrote summarizing key findings, originally published by Knight Digital Media Center at USC Annenberg. Hiring a sales rep or bringing on a partner to focus on revenue may prove critical to many operations. It is challenging – good sales people are in high demand and compensating them adequately is a stretch for small sites. But the inability to recruit and retain a good sales person may doom a site. Ask David Boraks, who closed his two local news sites in North Carolina earlier this year. By contrast, multiple sites in the study, including Riverhead Local on Long Island, N.Y., and Noozhawk in Santa Barbara, Calif., reported revenue increases when they took steps to improve their sales operations. Kim Clark, vice president for revenue development and partner at Noozhawk said a structure (outlined in a rate card) gives the sales rep has something to share with potential advertisers and set the value of the site. Without a rate structure, “everything is up for negotiation,” Clark said, which is time consuming and makes it harder to track and hit revenue targets. Successful sites have developed a following that enables them to charge premium rates. Most favor multi-month contracts. That time frame means the ads have time to work in raising advertiser visibility in the community and it means sites are not constantly reselling inventory. Noozhawk, charges $1,450 a month for prominent display in high-traffic sections of the site and $165 to $600 a week for run of site advertising, depending on prominence and size. Third Door Media, with its audience of 1.4 million unique monthly visitors, charges $4,000 per week for daily advertising across its network, which includes multiple sites and newsletters. Search Engine Land also offers CPM pricing at rates ranging from $25 to $60 depending on size and placement. By contrast, sites that rely mostly on CPM (cost per 1,000 impressions) or network rates, struggle. Budget Savvy Bride, for example, averages $3 per CPM against an audience of 82,000 unique visitors. She Finds, a fashion site, has seen its rate through the Glam network fall as low as $2 against 1.5 million uniques.. I continue to update my database of promising local news startups, Michele’s List, with support from the Tow-Knight Center for Entrepreneurial Journalism at CUNY. The center posted results of my 2015 survey of publishers and I wrote this post, originally published by Knight Digital Media Center at USC Annenberg. In the chaotic world of online news startups, I think it makes sense to take a long view. Whenever someone asks whether a big breakthrough is coming, I scratch my head. That’s because progress at this time is so incremental – a game of inches, feet, maybe yards but rarely miles – a marathon with no finish line in sight. I think it is productive to figure out what is working at specific sites, examine why it is working and try to figure out whether it can be replicated in other markets. That’s part of the philosophy behind Michele’s List, my database of “born on the web” local news sites and behind the publisher surveys I conduct periodically. Today, Tow-Knight Center for Entrepreneurial Journalism, my collaborator in this effort, publishes the results of our 2015 survey, the fifth I have conducted since I launched the database as a Reynolds Journalism Institute fellow in 2010. Progress: More than two-thirds of the publishers report that they increased their revenue in 2014 over 2013. Nearly half said they turned a profit last year. That’s encouraging evidence that a greater focus on revenue across the field is paying off. Challenges: Most of the sites are quite small, with revenues of $50,000 or less, and they are highly dependent on a single source of revenue – traditional display advertising. Each is a vulnerabilty. Together they create questions about whether a site has the capacity to develop enough of a business to get past $50,000 so a single founder isn’t trying to do everything. To be sure, some of the sites in this cohort, are relatively new. Just as newspaper layoffs spurred dozens of launches by refugee journalists in 2009-2010, the disintegration of Patch prompted many if its refugees to start sites in their base communities in 2014. The survey also showed younger sites tended to have less revenue. Others, however, may be stuck in neutral and some will likely shut down when their owners are forced to get a day job or develop other priorities. That said, there is a cohort of sites that are growing revenue above $100,000 annually and well beyond. Looking at their trajectories and the market factors that have fueled their growth is worthy of additional study. This post originally was published at Knight Digital Media Center @ USC Annenberg. Two prominent online news entrepreneurs are moving on. David Boraks, who operated two local news sites north of Charlotte, N.C., ceased publication June 1. Susan Mernit, who heads Oakland Local in California’s Bay Area, is looking for someone to take over the site or it will cease publication June 15. Both decisions underscore the commitment it takes to operate a local news start up as well as the challenges publishers face in many markets. Both operations have long been both highly entrepreneurial and highly vulnerable on the revenue side. Boraks said he concluded he needed to expand his operation to cover two additional towns and the entire Lake Norman area to build a sustainable business. He and longtime business manager, Lyndsay Kibiloski, also concluded that they had neither the time or the energy to do that. Boraks founded DavidsonNews.net in 2006 and launched CorneliusNews.net in a nearby town in 2011. He reported revenue in the range of $101,000-250,000 in 2014. Operating in a highly competitive market where potential advertisers have lots of options, including print publications and Facebook ads, most of them offering less expensive options than he could. Inability to recruit a full-time ad sales rep until 2014. The site struggled financially as part-timers proved ineffective. “We couldn’t find the right person who could work for us for what we could pay They were six-figure persons. The other jobs around here are that. We can’t afford that,” Boraks said in an interview. A full-time sales rep did significantly increase revenue in 2014, but sales and reader donations slumped during the past winter. In a farewell post, Boraks noted that traffic to the sites was at an all-time high with more than 100,000 monthly unique visitors, making it the largest publication north of Charlotte. Boraks plans to continue to work as an announcer on a local radio station and look for his next opportunity. Oakland Local, meanwhile, has also taken a hit on revenue, as co-founder and editor Susan Mernit has made Hack the Hood her primary focus. The project trains young people to do tech and social media, and they in turn help local businesses improve their web presence. In just a couple of years, it has grown to a $1.2 million operation. “I’m proud, six years is a big accomplishment,” Mernit said in an interview. Oakland Local, launched in 2009, is seeking new management and recently posted a request for proposals to take over the site. Oakland Local operates as a nonprofit. But it has been entrepreneurial in seeking non-philanthropic revenue, including advertising, in an economically challenged market. Mernit said she hopes individuals or an organization that can focus on revenue development as well as editorial will come forward soon. The site will continue to publish until June 15. The RFP says applicants must commit to raise $75,000-$150,000 to operate the site. I spend a lot of time looking at news start ups to see if they should be added to my database of promising sites, Michele’s List. I interview them about their business practices and I survey them about their revenue. I see a narrative of experimentation, innovation, and, yes, disappointment. I see progress on many fronts, stagnation on others. I see a narrative of learning, and this was in evidence this weekend as I followed #lion15, the Twitter feed of a meeting of online publishers in Philadelphia, sharing best practices with their peers. Boraks and Mernit have been an important part of this narrative. They blazed trails in a dynamic, challenging field. They launched in the great unknown of independent, “born on the web” local news sites. They demonstrated to more reluctant journalist founders that adopting business practices can produce financial results even though a stable revenue model was elusive their highly challenging local markets. They consistently shared what they were learning with other publishers. They deserve our thanks as they move on..